Hello Road. We haven’t been very close these past few years. I used to do California Road Trips – Giant Sequoia and Redwood trees, Big Bear, San Francisco, San Diego – but my tolerance for driving distances crashed and burned a few years ago. With the exception of Las Vegas and Tucson, I haven’t driven much. My 2014 car which had 12 miles when I purchased it in July 2014 has 6,650 miles 2 years later. I know – why do I have a car? I left my job of 7 years in February and one of my To Do before I started a new ‘real’ job was to drive cross-country. The last time I drove across country was in November 1991 when I moved from Orlando Florida to Los Angeles California. It was 3 days – 2 of them in Texas (! ), with stops to eat, use the bathroom and fill up. It wasn’t a journey; it was a drive to reach a destination. This time I want a journey – a solo Thelma and Louise, if you will, with a happy ending. Hence my road trip adventure! Me, my car – newly detailed and windows tinted for heat protection – and 3-4 weeks. I’m not taking the same route on the both legs of the road trip but I’m not venturing too far north. It’s August, I know, but I’m not chancing freak severe fall/winter weather. And, in full disclosure, I don’t want mountain driving. I like looking at them, living close to them, even visiting them but I’m not keen on high elevations and winding roads. I guess I’d rather take my chances with tornadoes and heat. My stops have a rhyme and reason that only I understand yet seem to fit into one of these categories. Granted, there is a side road trip to Ohio on the westbound trip to visit Amish country. Just because. I also imagine I’ll be diverting to small towns along the way to check out vintage and/or antique stores. Unlike airplane travel, my shopping is only limited by the empty space in my car! There’s so much beauty to see, plenty of good food to eat and, most important, lots of people to meet. This should be a well documented road trip. I have multiple cameras and an iPhone! I know I’ve over –planned and that’s ok. If I decide I don’t want to see something, I won’t; if I decide to modify my route, I will and if I decide I’ve had enough, I’ll turn around and come home. This is MY journey, after all. Time to Mow the Grass on this Poor Abandoned Blog! Wow, I feel I abandoned my blog as real life took over. I don’t understand how “working outside the home” mommy bloggers manage to work, care for their families AND stay active on their blogs. I’ve been so distracted that I didn’t realize my last blog was 12/31/2012! January: house hunting trip to St Louis Missouri. Offer in for 1 single family house. I refuse to talk about work since, as an accountant, January is the worse month of the year. February: house hunting trip(s) to St Louis Missouri. 2 offers in. February: early birthday trip to Paris France and Champagne, flying first class on British Airways. Fun trip but came home with the flu. March: Escrow closing trips to St Louis Missouri! I am a certified investment property owner. This completes step 1 of my retirement plan. These rental houses should cover their expenses and give me monthly cashflow. March: 1 rental house rented in a week. 2nd rental house requires plumbing and electrical work before I can rent it. Already I feel the joy of rental property ownership and the agony of living so far away. Fortunately everyone, from my realtor to the contractors, has been a pleasure to work with. Folks who take pride in their work and folks who live in town. They are my neighbors and it’s good to know that I’m supporting my community. Yet my blog is meant to record my real life — good, bad and ugly. Oh yes, the ugly. That’s for another post. For those of you who are able to give quality time to real life activities and your blog, please tell me how you do it! 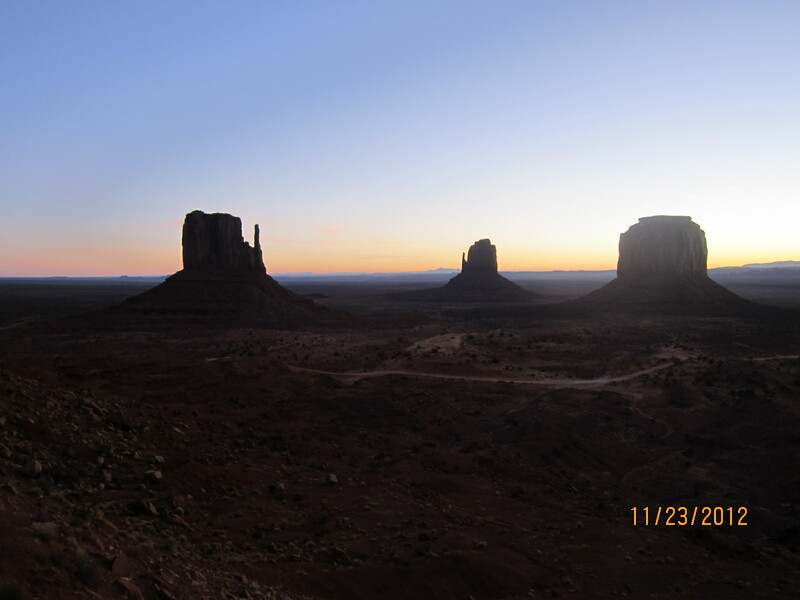 For Thanksgiving, I journeyed to Monument Valley — sacred center of the Navajo culture. The desire to go to Monument Valley started easy enough — fans of BBCAmerica’s show Doctor Who will remember “The Impossible Astronaut” episode was shot in/around Monument Valley. IN! 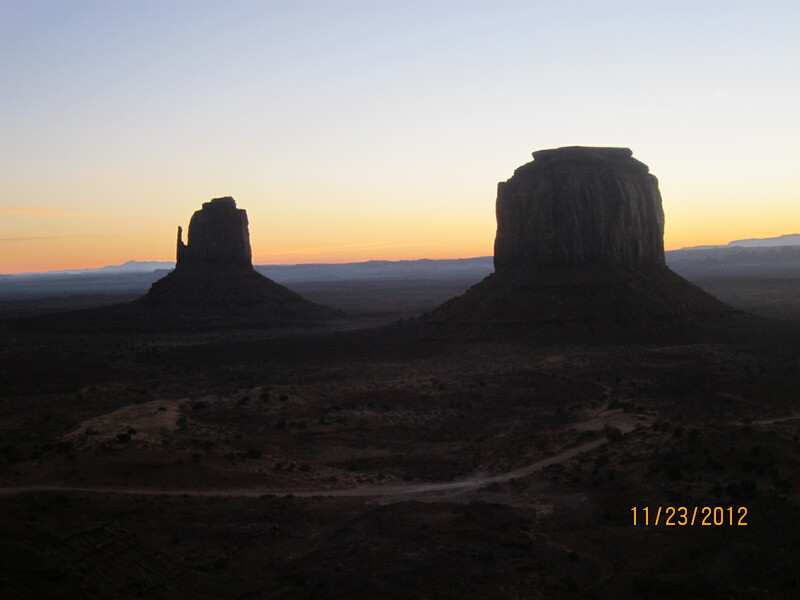 Did you know John Ford filmed many of his most famous Westerns in Monument Valley? Yup! DOUBLE IN. All I had to do was book the ticket and go …. except that was 2011. I didn’t make it because of work obligations. Fast forward to Thanksgiving 2012. Air fare – check; Hotel – check; rental car … oops. When I checked into Hertz, I had 2 reservations according to the chatty woman behind the counter. My choices? A SUV or a Mustang. Neither sounded appealing. For those who know me, you know I’m not a fan of SUV (never mind the trip to Wyoming in May) nor do I like going fast. Give me one of those ‘super-economy compact’ cars with roll-down windows. As long as there’s a slot for my phone charger, I’m happy. On impulse, I changed my mind and went with a Mustang. 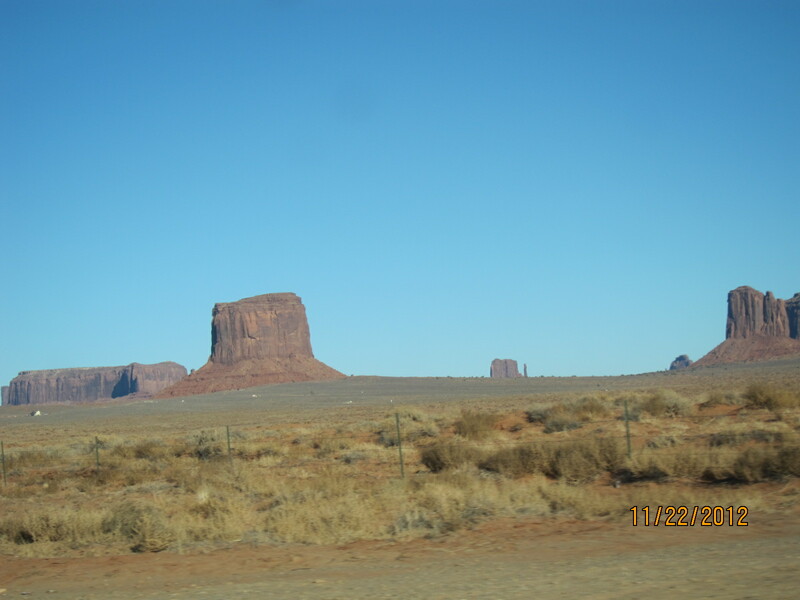 I was heading to Navajo country. It seemed right. The drive to Monument Valley was uneventful. Except for some of the mountain driving and the big rig that almost ran a SUV into the side of the mountain. 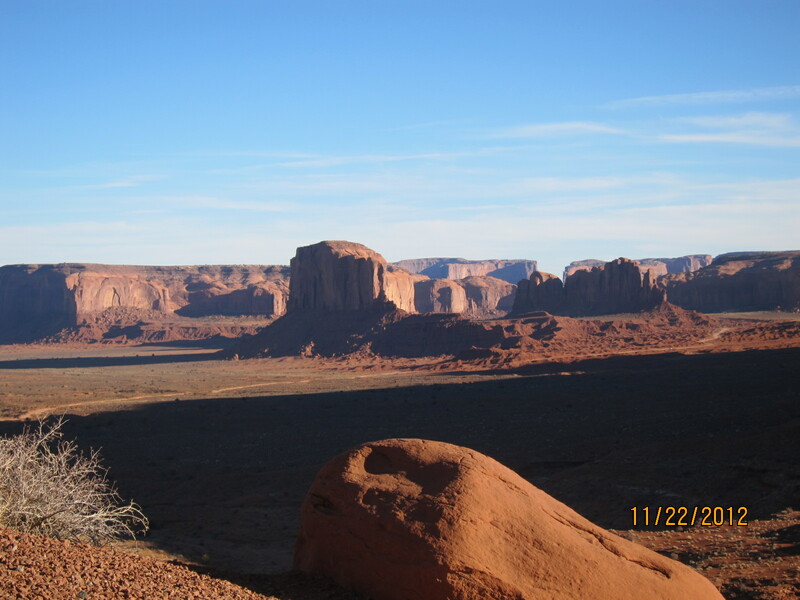 As the endless road stretched on (and on and on), suddenly in the distance, Monument Valley appeared! It’s hard to describe the feeling of achieving a bucket list item. A sense of accomplishment, a sense of pride and a sense of awe at the geography. It is more breathtaking than I imagined and my photos are woefully inadequate. 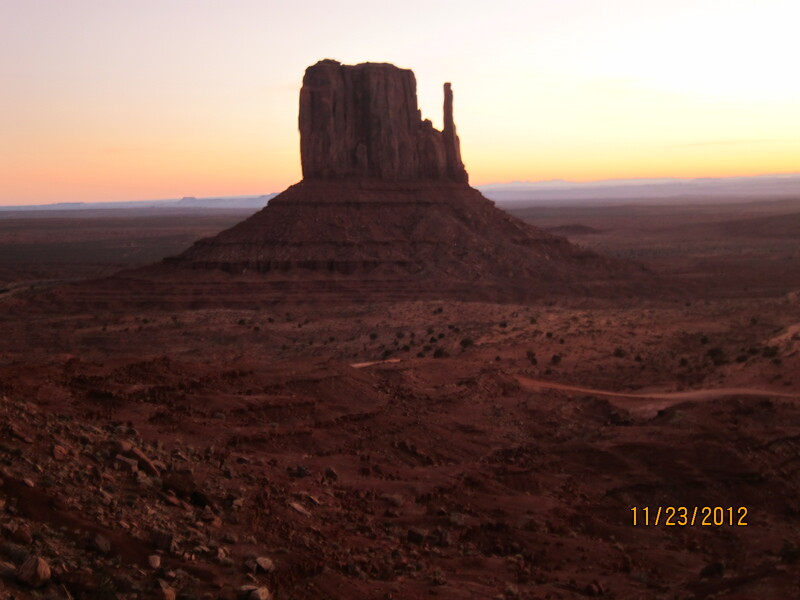 The road on the valley floor is traveled by the Navajo people who live there. They choose to live in this sacred place without electricity or running water, as their ancestors did. It’s also a 17-mile drive around most of the monuments. NOT recommended for cars low to the ground — I went for it! The mustang is a rental, after all! 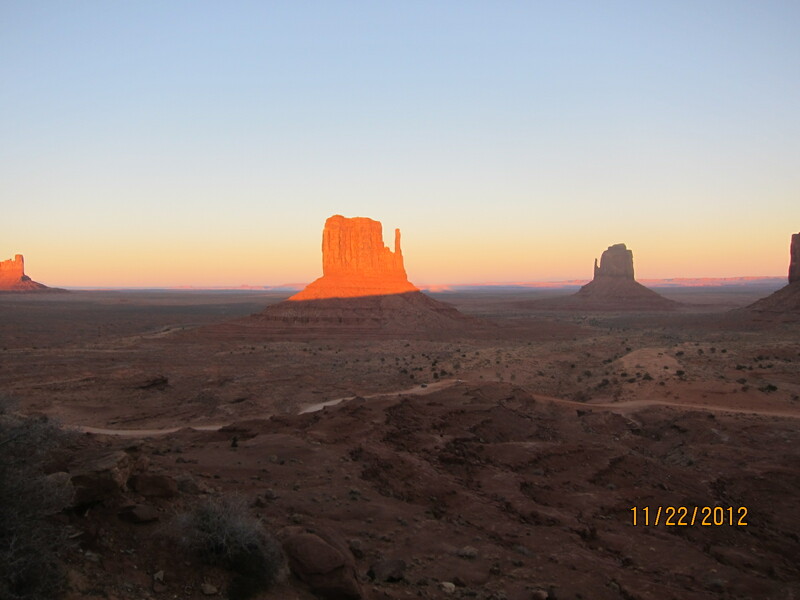 One of the “must do” items in Monument Valley is watching the sunrise or sunset. My hotel, The View Hotel, sits in the park and is built to give every room a view of the Valley. 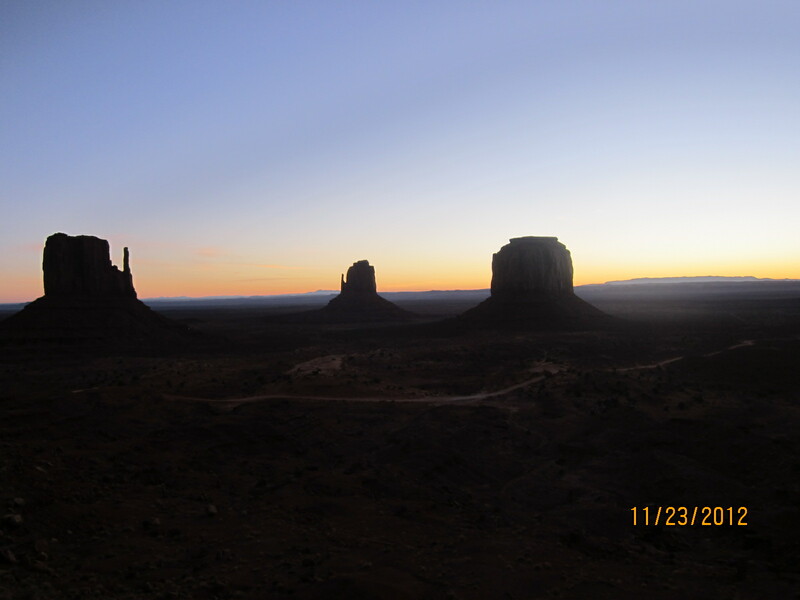 Monument Valley — a spiritual center for the Navajo, a spiritual center for those of us who visit. It was a special way to spend Thanksgiving. Just don’t get me started about the drive back to Phoenix at 4a! What was I thinking? Well, I changed my flight in order to make it home in time for a friend’s wedding. Without realizing the drive is 4.5 – 5 hours. I needed to be at rental counter by 9:30. Ugh. As I checked out, the desk clerk suggested I drive 40-45 mph because cows might be on the highway. Uh, ok. Cows? I didn’t know that Navajo land is free grazing which means cattle freely roam all hours of the day and night. I sat in my car as it warmed up and said a prayer to Mother Earth and Father Sky. Mother Earth, look out for me and the cows until Father Sky woke up. With that said, I started out. Whatever happened I was thankful and at peace. The first glimmer of day light appeared at 6:14a and I was never so happy as that moment. I don’t know which was worse — desolate night driving or mountain driving. Thank you Mother Earth and Father Sky. 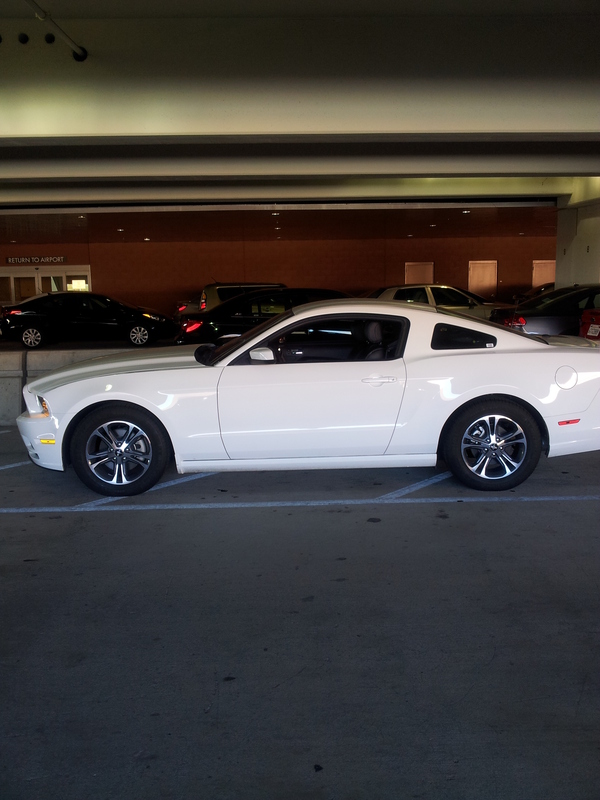 However, my Mustang was outstanding! I’m not a fan of fast or driving; however, I enjoyed driving that Mustang at 85-95 mph! (not sure which guiding spirit to thank for the safe delivery to Phoeniz Airport but THANK YOU). IFBC 2012 in Portland Oregon. 2.5 days of engaging and enlightening interaction with food bloggers. Just wow! Conference started Friday afternoon and continued jam-packed until Sunday afternoon. Friday started with lunch hosted by Organic Valley but not before I oohed and aahed at the Oxo table. LOVE OXO products and have for years. Organic Valley’s lunch was to introduce its cheese slices and, keeping with that theme, lunch was grilled cheese and apples. Although delicious, there were no offerings for attendees with dietary concerns (gluten-intolerance, vegan, etc). Best moment – running into MeganTheGFVegan, a charming food blogger from Canada I met in June! I didn’t know she was coming (note to self: read attendee list next time). Next best moment? Chatting with my tablemates about Doctor Who. Wheeeeeeeeeee! I didn’t expect to meet Whovians at a food blogger conference. Candace, author of the blog, Candace Karu, and Tara, author of the blog, TeaRelish, are devoted Whovians and our 10-15 min chat was so much fun. Even better, Candace works for the Cabot Creamery Cooperative! Talk about some great cheese. The live food blog event showcased Oregon products. 10 companies each had 5 minutes to pitch their products while we tweeted or blogged about them. Fortunately for me, most of them ship outside the state. Jacobsen Salt Co – hand-harvested Sea Salt from the Oregon coast. Domestic salt that competes with better known European sea salts. F/V Sonia’s Wild Albacore Tuna – this was the most amazing canned tuna you will ever eat. It tastes fresh, slightly salty and delicious. The Schmid Family Farm – the marionberry jam with cream cheese on crackers. Following all this deliciousness, I went to my 1st session: Building Community Online and Offline presented by Keren Brown of Foodportunity and The Frantic Foodie. What a great session! Keren is an animated outspoken speaker with lots of great ideas for building a community. My purpose for going to the conference was twofold: to learn more technical blogging aspects and, more importantly, to connect with other bloggers and build relationships. Keren’s session was perfect. Here I am — day 2 of my North Carolina drive trip. I am in Tennessee, heading to the Great Smoky Mountain National Park, no schedule, no plan, 100 degrees outside and I’m cruising in my black Nissan Sentra! I don’t like mountain driving so what the heck was I doing? I live in California, have driven in California, Colorado, Nevada and Utah …. surely Tennessee can’t be that bad. It was. Getting to the National Park involved lots of ups and downs on steep highways. I pulled off the road often to let cars pass. But again I wasn’t in a hurry and had no plan. I spent the afternoon in the park, hiking and sightseeing in the town of Cherokee. It’s home to the Eastern Band of Cherokee Indians and the Cherokee Museum. The Museum is worth a trip! It dispassionately presents the history of the Cherokee and offers something for children and adults. My next surprise drive through was Gatlinburg, Tennessee. What a gorgeous town, even as it’s overrun with tourists. Would I go back? Absolutely. it’s gorgeous, rustic and surrounded by the Smoky Mountains. Pigeon Forge is home to Dollywood (who knew?) and I decided to go. Except as I’m driving toward Dollywood, I hear storm warnings on the radio. When I arrive at the park, the parking folks told me the park was closing because of the coming storms. Disappointed? Yup but I continued on, this time opting to drive on to Knoxville. And the proverbial c**p hit the fan as I neared Knoxville. The skies grew dark (really dark) and as I neared Knoxville, the wind picked up. I had a great recommendation for a bbq place in Knoxville and was heading there. Until I exited downtown Knoxville and tree limbs, leaves, and trash cans were blowing around. Oh maybe I don’t need to drive around Knoxville, maybe I should I continue driving. So I did. The dark skies opened up and the downpour started. It was more than a downpour, it was torrential rain along with thunder and lightning. Lightning that hit trees on the side of the road and started a fire. Yup, saw that. Being headstrong, I planned to continue on but I could barely see 5 feet in front of my car. When 5 truckers exited the highway at one time, I followed them. If truckers weren’t willing to drive on, I certainly wasn’t. Later I heard on the 10p news there were 2 deaths in the park due to flash flooding in the National Park and extensive damage in Knoxville from the severe storms. The thought suddenly flashed in my mind — no one knows where I am! It was probably time for me to head east and check in with family. But first I enjoyed a bottle of wine. Delicious! Best $9 spent on wine. It made sitting in my Motel 6 room pleasant. I’d like to say I dutifully headed east to family. Maybe next time. While I did head east, I saw a brochure for Chimey Rock and decided to detour. The 2.5 miles up the narrow winding mountain road to reach the park left me shaking in the knees. My Sentra wasn’t meant to climb up steep hills even if I had the gas to the floor. Fear of mountain driving exploded. I spent the afternoon there for several reasons — the hiking and the views are magnificant! And the elevator. Yup, elevator! A 26-story elevator built in the mountain! And, um, I wasn’t ready to drive down the mountain. I needed to work up my courage and game plan because on the down I was on the outside. Yeah, the side next to the cliff.